u-he makes great software synths, but some of them can tax both your CPU and programming skills to the limit. Hive, says the company, is different: it's been designed to be fast and simple in operation and light on your processor. Central to this 'easy to use' philosophy is a streamlined single screen interface and what's said to be a "fluid workflow". 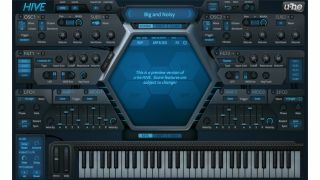 However, u-he also stresses that neither sound quality or creative control have been sacrificed, and that Hive has more than enough features and flexibility to deliver top-notch tones. Hive is actually available now as a public beta, and is scheduled for release in May. Pre-orders are being taken at an introductory price of $99 plus VAT (the full price will be $149 plus VAT). Find out more on the u-he website.